The great thing about pop up campers is that you can get them into places where you can’t really get any other RV, but that doesn’t mean you can take them off road with impunity — at least not without potentially snapping an axle or puncturing a holding tank. The fact is that there are a lot of things that can go wrong when you take just any old pop up camper off road, any of which can bring your trip to a screeching halt. So what is an off road enthusiast to do — modify an existing pop up into an off road tent trailer, or go with a pop up truck camper in the bed of a vehicle that’s really built for off roading? Those are both viable options, but you can also look for an off road pop up camper that’s specifically designed to take any sort of punishment that you can dish out. Most RVs can’t stray far from the beaten path, but some pop up campers can go off road. 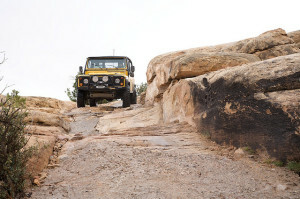 If you enjoy taking the road less traveled — or leaving the road altogether — then you’re probably already familiar with the differences between a vehicle that’s designed for highway driving and one that’s capable of off-roading. In order to deal with the sometimes trecherous conditions encountered when off-roading, you need a vehicle that isn’t going to snap an axle, snag anything on the undercarriage, or lose traction. In that same vein, pop up campers that are designed for use on paved roads just don’t have what it takes for any kind of real off-roading. They sit too low to the ground, and they just plain aren’t tough enough. One solution to that issue is to just not tow a tent trailer in the first place, and if you drive a pickup truck, that might be an option worth exploring. There are plenty of low-profile, lightweight pop up truck campers that are perfect for taking off road. However, a truck camper isn’t always an option. If you drive anything other than a pickup, or you need to use your bed to carry gear, then you’ll want to look for an off road pop up camper that’s specifically built for that purpose. There are two main choices if you’re looking for an off road pop up camper: a tent mounted on a resiliant utility trailer, or a pop up camper that’s specifically designed for off-roading. Some other pop ups are capable of handling tough conditions even though they aren’t specifically designed with that in mind, but you have to take into account the specific areas that you like to camp. Some manufacturers also offer an optional “off road package” that includes features like higher profile tires for increased ground clearance. 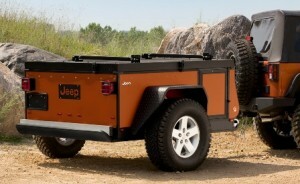 If a tent-on-trailer design suits your needs, then that might be the perfect thing for off-roading. This design also has the added benefit of doubling as a cargo trailer, which means you can carry extra hiking gear, an ATV, or whatever else you want on the folded up trailer. If you’re serious about off-roading, Livin Lite makes pop up campers specifically designed for tough conditions. Previous story Can I add a pop up camper air conditioner?